Bainbridge Island is located near Seattle, Washington. It is home to approximately 26,000 people, including Lisa Martin who has always wanted to build a green home, but took it upon herself to build a net zero home after being inspired by a presentation on the topic by David Johnston. Lisa had never built a house before, so she hired her neighbor, Russ Hamlet, architect to help with the design. 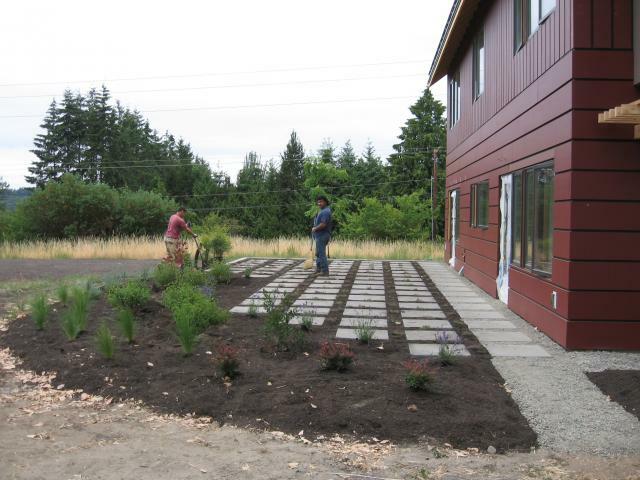 There were no green homes being built in Bainbridge at the time, so Lisa and Russ decided to take on the challenge. Their efforts were rewarded when the project was awarded LEED gold certified and also won the 2007 Green Hammer Award. Most importantly, the home created a buzz about the possibilities of green building on the island. “It is important to take advantage of what is naturally available on the site.” says Lisa. The site had great solar potential so they decided to put an 8 KW PV system on the roof. Seattle actually gets a surprising amount of sun in the summer despite its cloudy weather. The incentive programs like net energy; (meaning they can bank their electrons on the grid for the winter) helped make the decision to install a solar system. By challenging the assumptions of these and other sub-contractors, this project has spawned a new outlook on how homes should be built. Even the spray insulation caused a lot of public interest. It hadn’t been used before in other homes on the island. Russ had to be more involved throughout the project than is typical for an architect. Even though the construction drawings specified advanced framing techniques, he caught the framers framing in the conventional way. Russ had to draw up framing elevations for the exterior walls and teach the framers how to frame the corners with two studs and also to only install headers in supporting walls. The framers were skeptical at first and it took a while to get them onboard, but by the end of the project they were sold on the methods, and were eager to take the new techniques that they learned and make them part of their everyday practice. The electrical contractor was another who needed convincing that there were better methods available. He too was skeptical at first, about the unconventional project specifications, but later embraced the energy efficiency measures, researching LEDs and advanced lighting technology. He installed a 220V outlet in the garage for an electric car and even placed a small plaque above the outlet describing its purpose. 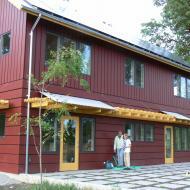 There are many lessons to learn when building your first net zero energy home. 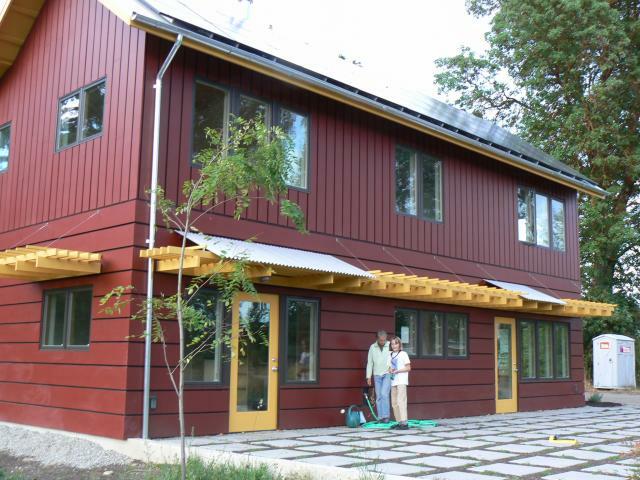 This home has a HERS rating of 40,(without renewables) and while this is considerably lower than the average American home, it is high for a net zero home. “This home was a learning experience; conservation will come first on the next project”. 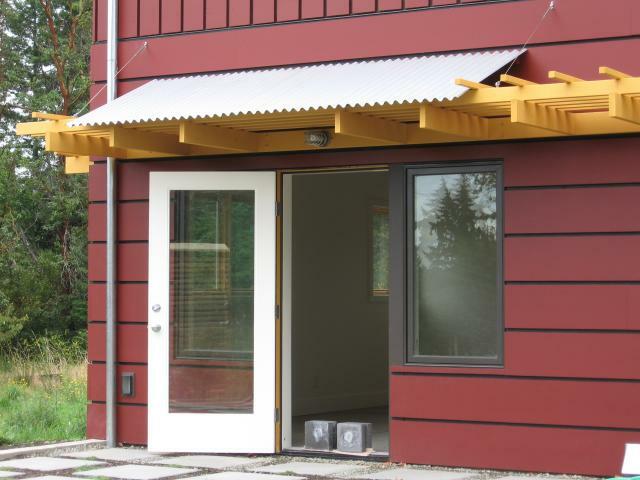 Some things that they plan to do differently next time, for example, will be to put an inch of rigid insulation under the siding. 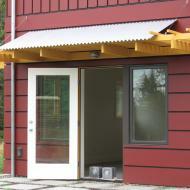 It was a consideration, but was decided against due to cost and difficulty in securing the siding. They also plan on installing better windows. The current Pella windows have a U-value of 0.34. In comparison, most zero energy homes have installed triple pane windows with a U-value of less than 0.1. “This home has a lot of bells and whistles”, says Lisa, the next will have more behind the walls than show. One of the problems that they intend to avoid next time is an oversized electrical boiler. This is a common problem in well insulated homes as many HVAC contractors are unfamiliar with low energy loads and install the system without using proper sizing software. A simpler, cheaper system would have sufficed as the current boiler is oversized and hence using more electricity than is needed. The boiler is used in part to heat the radiant floor system. Lisa and Russ feel that the radiant system was overkill (and a big expense) and that they probably wouldn’t install one again. Part of the reason that the boiler was oversized is that the living room has a high efficiency wood stove that was not accounted for in the calculations. This stove helps offset the heating load as the new homeowners use it frequently during the winter months. The site doesn’t have a lot of natural shading, and Russ was concerned about the home overheating. With this in mind, the home is designed with large overhangs and trellises to provide shading during the summer. Glazing on the south side was kept to10% of the floor area. By adhering to this recognized design rule, the house stays at a regulated and comfortable temperature. 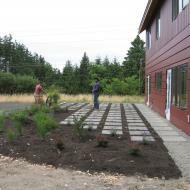 This project was a huge undertaking for Russ and Lisa. They both have learned a great deal during the process, especially how important it is to focus on reducing the heating loads. There are several significant things that they plan to do differently on the next project besides beefing up the insulation. They intend to have more design charette meetings with the sub-contractors to make sure everybody is on the same page. The home caused a lot of interest on the island, and has inspired the many people who came to visit it during construction. It has become a working demonstration of what is possible to achieve. Heating source: Radiant floor heated concrete floor with On-demand Slant-Fin electric boiler, high efficiency wood burning stove and Supplemental electric wall heaters.